X-1000VL CALL MR VINH 0914175928 FOR BUYING PRODUCTS. • For heavy duty labeling demand. • 203dpi low resolution models available. • 32-bit CPU,up to 4ips printing speed, and enlarged memories. • Adjustable reflective and transmissive double sensor system ensures precise label detection to meet versatile media demands. • Centronics parallel,RS-232 and USB and interfaces available for versatility applications. • Industrial-strength media management: 360M ribbon wax & 8 media compartment. • An external switch sets the printer for use with either ribbon wound ink-side in or ink-side out. • Durable and easy maintenance:easy-to-replace cutter and peeler. • Support 1D/GS1 Data bar, 2D/ Composite codes and QR barcodes. • Full range of options:Cutter,Peeler,Media stacker,Font card,RTC. 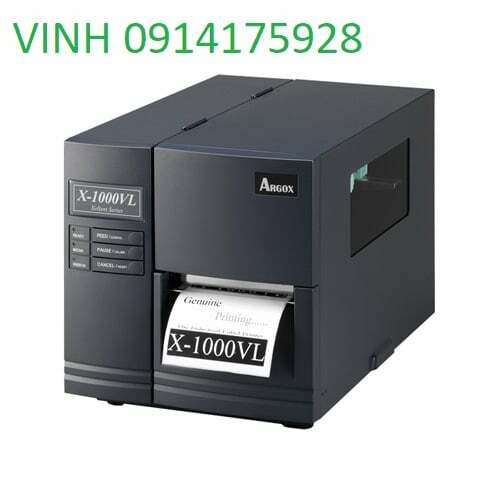 he new X-1000VL industrial barcode printer offers outstanding performance and value in an all-metal housing well-suited for harsh environments. A 32-bit RISC microprocessor provides print speeds up to 4ips, which is ideal for medium-volume printing requirements. The 4MB Flash memory and 8MB SDRAM ensures smooth operation and high reliability. The user-friendly print mechanism lets you easily adjust ribbon pressure and print quality by hand—no need for special tools. An external switch sets the printer for use with either inside or outside coated ribbons, and an adjustable ribbon guide stabilizes the ribbon during printing. The X-1000VL printer is flexible, easy-to-use, and offers value and high performance printing for industrial environments.